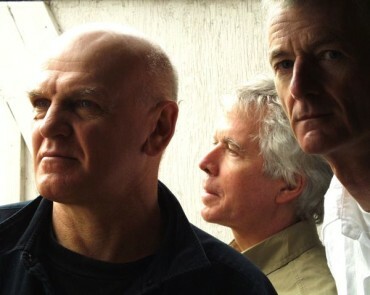 Van der Graaf Generator are Peter Hammill (vox, gtr, kbd), Hugh Banton (organ, bass) & Guy Evans (drums , percussion), the three surviving members of the original group line-up of 1968. The band originally formed in 1967 while its members were studying at Manchester University. The three-piece was composed of Peter Hammill, Nick Pearne (organ) and Chris Judge Smith (drums). When the band turned professional in 1968 Pearne was replaced by Hugh Banton. Tony Stratton-Smith became the band’s full-time manager and through him the band acquired a bass guitarist, Keith Ellis. Drummer Guy Evans joined soon afterwards. This line-up released a single – ‘People You Were Going To’ b/w ‘Firebrand’. Judge Smith left the band, amicably, shortly after the recording. Although the four-piece line-up toured successfully in 1968, performed on BBC Radio 1’s Top Gear radio show and supported Jimi Hendrix at the Albert Hall, it briefly broke up during 1969. Pressures leading to this included the theft of the band’s gear in London. In July 1969 Hammill went to record his first solo album. Banton, Evans, and Ellis joined him as session musicians and the resulting ‘The Aerosol Grey Machine’ was subsequently released as the first VdGG album, on Mercury. Tony Stratton-Smith formed Charisma Records in 1970 and signed the band as his first act. Before recording their second album, ‘The Least We Can Do Is Wave To Each Other’, Ellis left and was replaced by Nic Potter, and David Jackson (saxophones and flute) was added to the line-up. ‘The Least We Can Do…’ was swiftly followed by ‘H to He, Who Am the Only One’. Potter left midway through that recording, and the band decided to carry on without a bass guitarist, with Banton on organ bass pedals. The Hammill/Banton/Jackson/Evans quartet that resulted from ‘H to He’ – often considered the ‘classic’ line-up – went on to record ‘Pawn Hearts’ in 1971. It contains just three tracks, ‘Lemmings’, ‘Man-Erg’ and the 23 minute concept piece ‘A Plague of Lighthouse Keepers’. The album proved highly successful in Italy, topping the chart there for 12 weeks. The band toured extensively from 1970 to 1972, but fatigue and finances caused the band to implode and Hammill returned to his solo career. Banton, Jackson and Evans all contributed to Hammill’s solo work at various times. By 1975 the band were ready to work with each other again, and three new albums were recorded during ’75 & ’76 – ‘Godbluff’, ‘Still Life’ and ‘World Record’. At the end of 1976 first Banton and then Jackson departed. Nic Potter returned on bass, and Graham Smith joined on violin. This line-up, with the band’s name shortened to Van der Graaf, produced the album ‘The Quiet Zone/The Pleasure Dome’. Charles Dickie then joined the band on cello for live work, documented on the live album ‘Vital’. But by the time Vital was released, in the summer of 1978, the band had already split. In 2003, Banton, Jackson, and Evans joined with Hammill during his solo concert at London’s Queen Elizabeth Hall to perform the song ‘Still Life’. Following the performance, discussions between the band members led to writing and rehearsal of new material in mid-2004. A double CD, ‘Present’, containing this material was released in April 2005. A reunion concert took place at the Royal Festival Hall, London, on 6 May 2005, followed by several European dates in the summer and autumn of 2005. A live double CD of the complete Royal Festival Hall concert was released as ‘Real Time’. 2006 was Year Zero for Van Der Graaf Generator. In January of that year Hugh Banton, Guy Evans and Peter Hammill met for lunch in the shadow of the Royal Festival Hall, the scene of their remarkable reunion show the previous year. At the time the venue was in the process of refurbishment and renewal; in the light of David Jackson’s departure from the group VdGG, too, found themselves wondering what – if any – future awaited them. A number of conclusions were quickly reached: that to be true to the Van der Graaf spirit and to move the story on to the next chapter they had to continue as a trio and simultaneously forge new approaches in method, style and content. They emerged from an exploratory rehearsal period with new material as well as reworked versions of their earlier songs and took to the stage again early in 2007. Fired up by the strength of the audience’s response they recorded the album “Trisector” in the summer. “Trisector”, released in 2008, was acknowledged as a step-change up from the first reunion CD, “Present”. Live performances of the new material in Europe, Japan and North America followed. In late 2008 and early 2009 preparations began for the next set of recordings. Song fragments were gathered, ideas exchanged, theories, policies and directions discussed. In April 2010 the band met up for intensive tracking sessions in Cornwall, arranging, rehearsing and recording the album in a week. Some of the pieces were already fully-formed songs; others, even at this stage, remained more sketches than fully realised works. Over the next months the tracks were overdubbed, edited and adapted by the band in their own studios. A constant exchange of files over the internet or on CDR kept the project in full alignment. By September the project was ready to be mixed. Hugh Padgham had agreed to take on this part of the process – the first time anyone outside the band had been entrusted such responsibility. After three weeks in Hugh’s London studio, Sofasound (which shares its name with Peter’s original home set-up), “A Grounding in Numbers” was completed. With a fantastic clarity and depth of sound and a helter-skelter stretch of tunes, “A Grounding…” sees VdGG pushing ever further forward into the twenty first century. Clearly, they know they’re a group with a certain history – but they are also an emphatically modern one.